On the final day of the Tour de France when the peloton rides into Paris, the race for the Yellow Jersey is considered over, the leader no longer pressured by the other contenders, regardless of how close the margin is. Other parts of the Tour de France are still in play, in particular the exciting sprint finish as they make a number of laps around the Champs-Elysees. I explained this tradition to our group of seven that had gathered for the final day of the 2015 Sierra Challenge, my way of congratulating Robert Wu on a fine victory in his first try. Robert had been wary of me for most of the past week as I sought to gain advantage through stealth and other means as the runner-up, but in the end he proved too strong and never wore down. The pre-race favorite, Eric, was also with us this morning. His minor accident on the 3rd day had kept him out of the Challenge for several days, allowing an actual race to be made for the Yellow Jersey by the rest of us. Eric's tenacity was inspiring as he returned on the 6th day to finish the rest of the Challenge. He could scramble along class 3 rock with only one hand as well as any of us could manage with two. Today's outing was to Johnson Peak, a remote peak in the Golden Trout Wilderness about 8mi west of the Sierra Crest at Cottonwood Pass. How it made the list of this year's peaks is a bit of a mystery, even to me. It isn't particularly high at 11,371ft and hasn't a good deal of prominence either. Somehow it caught my fancy while I was perusing maps at some time in the past and landed its way almost subconsciously on this year's Challenge. The early start was to facilitate the long distance, more than 12mi one way, than the elevation gain which comes in at less than 5,000ft. Sunrise came shortly after 6a while we were still making our way up to Cottonwood Pass, a 4.5mi trek from the TH at Horseshoe Meadow. We took a short break upon reaching the pass around 6:30a, Mt. Johnson in view to the west across a sea of forested terrain broken only occasionally by brown meadows. After dropping a discouraging 1,200ft down the west side of the pass, we passed through Big Whitney Meadow was the largest of the meadows in this area, more than a mile across and quite dry at this time of year. In times past these meadows have seen extensive grazing but there were no signs of any such use for at least the past several years. West of the meadow we crossed paths with a trail heading north to Siberian Pass before starting up and over a 500-foot rise separating Golden Trout Creek from Barigan Stringer. At the latter we reach another junction, this one with the Rocky Basin Lakes Trail, more than 10mi and 3.5hr from our starting point. We took another break here, five of us traveling together in a somewhat leisurely fashion. While perusing maps, GPSr and staring through a bunch of trees towards a summit we could no longer see, we concluded it was time to leave the trail, trusting mostly to the GPSr to find our way through the last stretch of forest cross-country to our peak. 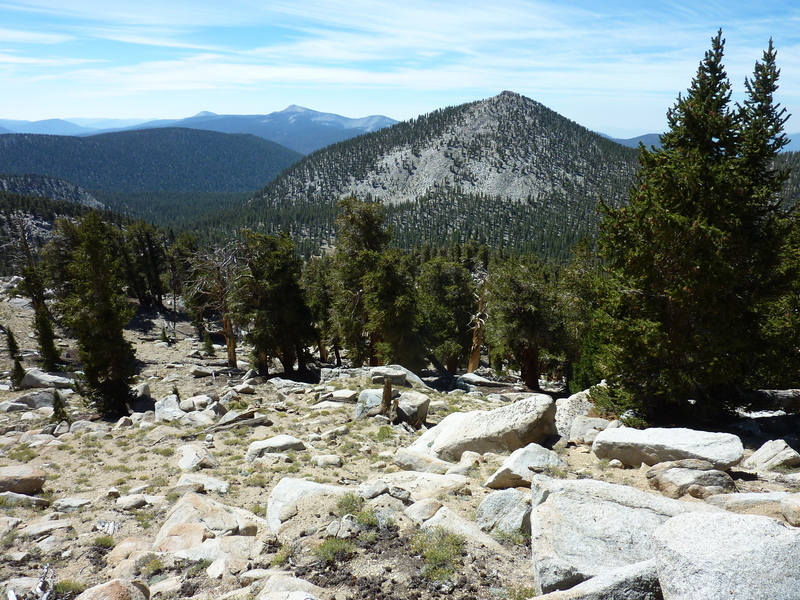 Another hour was required to see us up the last section of blocky granite that forms the upper half of Johnson Peak. We found two summits and fine views in all directions. The benchmark and a nice register book were found at the east summit but we all agreed the west summit, separated by about 100yds of easy scrambling, was higher. We were at the lower summit for about 15min when we spied Chris coming up the same east side that we had ascended. He had started before us in the early morning to time his arrival to coincide with ours, apparently timing it quite well. We took a group photo with six of us before starting to descend. Eric and I were interested in visiting the Boreal Plateau and Siberian Outpost a few miles to the north at the boundary between the Golden Trout Wilderness and SEKI National Park. The fanciful names conjure up images of the Russian taiga and cold Siberian winters and we were curious how the names may have come about. Little about the sidetrip gave us a clue to their etymology, but it was enjoyable nonetheless. While the rest of our party descend back off the east side, Eric and I headed north, descending to a saddle with Boreal Plateau. Eric diverted left to visit Johnson Lake since he was short on water while I headed more directly up from the saddle along a broad, wooded ridgeline leading to the plateau. I met up again with Eric before we reached the windswept plateau where the forest suddenly gives way to barren sand, gravel and rock, lightly vegetated with small clumps of grasses, periodic flower displays and other sparse plants. There are fine views stretching west across the Kern River, north across Rock Creek and south overlooking Rocky Basin Lakes and much of the Golden Trout Wilderness. Because the plateau is so broad it was not easy to find a highpoint, but with the help of the GPSr's altimeter we made a good guess after visiting all the likely candidates. We continued east along the crest, visiting the slightly higher Peak 11,557ft about a mile further in that direction. Beyond that, where the ridge grows more rugged and difficult to follow, we traversed the forested north side of the ridge before dropping down to the grassy steppes of Siberian Outpost. This bleak, sandy stretch resembling a desert playa made for an easy walk as we passed by the Siberian Pass Trail a second time before making our way up to the PCT found about 300ft above the eastern edge of Siberian Outpost.